Jacob ROE (JM11-14) of Bristol and West AC, was first over the line in 07:56 - 7th time in 29 appearances. Rudy WILLIAMS (JM11-14) (Unattached) was second over the line in 08:00. Ishmael BRADLEY (JM10) (Unattached) was third over the line in 08:26. Ewa RYDLEWSKA (JW11-14) (Unattached) was first (9th overall) over the line in 09:43 - second time in 15 appearances. Dominique WILLIAMS (JW11-14) (Unattached) was second (10th overall) over the line in 09:45. Primrose WIESENTHAL-SAUNDERS (JW10) (Unattached) was third (15th overall) over the line in 10:47. Rudy WILLIAMS (JM11-14) was graded 69.95% for the time 08:00 (second overall). Oscar MBOGO (JM10) was graded 68.77% for the time 09:28 (7th overall). Jacob ROE (JM11-14) was graded 68.58% for the time 07:56 (first overall). This week there were 70 runners, of whom 10 were first timers and 8 recorded new Personal Bests. Representatives of 2 different athletics clubs took part. Windmill Hill junior parkrun started on 8th November 2015, and since then 584 different runners, including participants from 9 athletics clubs, have completed 3,223 runs covering a total distance of 6,446 km, and there have been 697 new Personal Bests. The female record is held by Harriet LAMBE who ran in a time of 00:07:36 on 21st February 2016 (event number 15). The male record is held by Jack BANNISTER who ran in a time of 00:06:55 on 26th June 2016 (event number 33). The Age Grade course record is held by Beck HARDING-HILL who recorded a 77.18% run (07:03) on 26th June 2016 (event number 33). Today's full results and a complete event history can be found on the Windmill Hill junior parkrun Results Page. Jacob ROE (JM11-14) of Bristol and West AC, was first over the line in 08:17 - 6th time in 28 appearances. Rudy WILLIAMS (JM11-14) (Unattached) was second over the line in 08:28. Joe DOYLE (JM10) (Unattached) was third over the line in 08:37. Ewa RYDLEWSKA (JW11-14) (Unattached) was first (13th overall) over the line in 09:47 - first time in 14 appearances. Olivia TARR (JW10) (Unattached) was second (15th overall) over the line in 09:52 - has been first to finish on 2 previous occasions. Iorwen ROTHERAM (JW10) (Unattached) was third (16th overall) over the line in 10:08. Ronnie WILMOTT (JM10) was graded 69.19% for the time 08:39 (4th overall). Billy HARPER (JM10) was graded 67.13% for the time 08:55 (7th overall). Joe DOYLE (JM10) was graded 67.04% for the time 08:37 (third overall). This week there were 96 runners, of whom 11 were first timers and 18 recorded new Personal Bests. Representatives of 3 different athletics clubs took part. 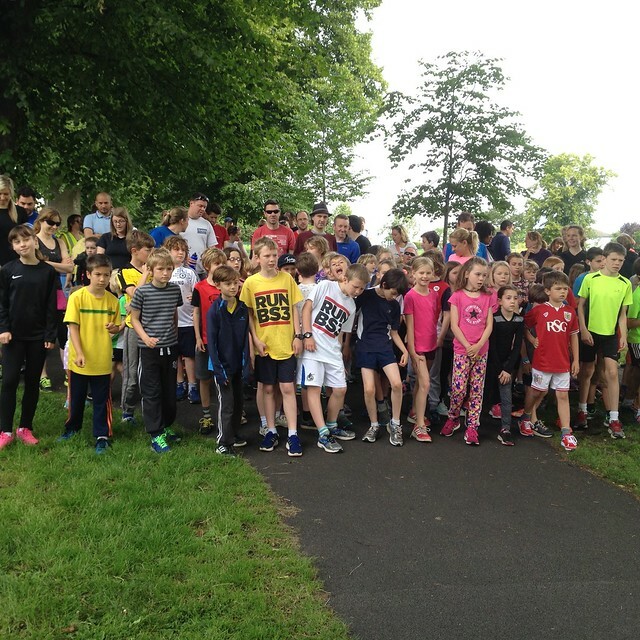 Windmill Hill junior parkrun started on 8th November 2015, and since then 574 different runners, including participants from 9 athletics clubs, have completed 3,153 runs covering a total distance of 6,306 km, and there have been 689 new Personal Bests. In typical Bristol style, the morning started with an unexpected rain shower, which was followed by several more! It didn't dampen our runners' spirits though and a cracking 17 runners posted personal bests. Congratulations also go to Kofi, Jessica, Isaac and Jade who were awarded their half marathon wristbands and Alesha and Beth who collected their marathon wristbands. Isaac HARRIS-COOK (JM11-14) (Unattached) was first over the line in 07:57 - 7th time in 12 appearances. Jacob ROE (JM11-14) of Bristol and West AC, was second over the line in 08:02 - has been first to finish on 5 previous occasions. Joe DOYLE (JM10) (Unattached) was third over the line in 08:40. Lauren CHAPMAN (JW10) (Unattached) was first (12th overall) over the line in 10:08 - 18th time in 28 appearances. Ewa RYDLEWSKA (JW11-14) (Unattached) was second (14th overall) over the line in 10:15. Megan HART JONES (JW10) (Unattached) was third (15th overall) over the line in 10:22. Oscar MBOGO (JM10) was graded 71.41% for the time 09:07 (7th overall). William GAGE (JM10) was graded 69.58% for the time 08:57 (5th overall). Isaac HARRIS-COOK (JM11-14) was graded 68.44% for the time 07:57 (first overall). This week there were 78 runners, of whom 4 were first timers and 17 recorded new Personal Bests. Representatives of 2 different athletics clubs took part. Windmill Hill junior parkrun started on 8th November 2015, and since then 564 different runners, including participants from 9 athletics clubs, have completed 3,057 runs covering a total distance of 6,114 km, and there have been 671 new Personal Bests. Well done to everyone who ran, jogged or walked the course this morning. A special well done to Gabriel Norris, Persephone Hubbard and Sebastian Barnacle who picked up their half marathon wristbands. Next week Southville Running Club have kindly offered to take over the majority of volunteer posts. Joseph HULL (JM11-14) of Bristol and West AC, was first over the line in 08:15 - third time in 5 appearances. Ronnie WILMOTT (JM10) (Unattached) was second over the line in 08:22. Jacob ROE (JM11-14) of Bristol and West AC, was third over the line in 08:26 - has been first to finish on 4 previous occasions. Rebekah WRIGHT (JW11-14) (Unattached) was first (13th overall) over the line in 09:48 - 4th time in 10 appearances. Iorwen ROTHERAM (JW10) (Unattached) was second (17th overall) over the line in 10:22. Emily LEATHWOOD (JW10) (Unattached) was third (26th overall) over the line in 11:06. Ronnie WILMOTT (JM10) was graded 74.43% for the time 08:22 (second overall). Oscar MBOGO (JM10) was graded 72.88% for the time 08:56 (7th overall). Joseph HULL (JM11-14) was graded 67.83% for the time 08:15 (first overall). This week there were 92 runners, of whom 4 were first timers and 14 recorded new Personal Bests. Representatives of 2 different athletics clubs took part. Windmill Hill Juniors parkrun started on 8th November 2015, and since then 467 different runners, including participants from 7 athletics clubs, have completed 2,238 runs covering a total distance of 4,476 km, and there have been 514 new Personal Bests. The female record is held by Harriet LAMBE who ran in a time of 00:07:36 on 2016-02-21 (event number 15). The male record is held by Jack BANNISTER who ran in a time of 00:06:55 on 2016-06-26 (event number 33). Today's full results and a complete event history can be found on the Windmill Hill Juniors parkrun Results Page. Congratulations to Jack Bannister for setting a new course record. Jack BANNISTER (JM11-14) of Bristol and West AC, was first over the line in 06:55 - third time in 3 appearances. Fred HAWKER (JM11-14) of Bristol and West AC, was second over the line in 06:58 - was first to finish once before. Beck HARDING-HILL (JM11-14) of Bristol and West AC, was third over the line in 07:03. Rebekah WRIGHT (JW11-14) (Unattached) was first (26th overall) over the line in 09:22 - third time in 9 appearances. Ewa RYDLEWSKA (JW11-14) (Unattached) was second (31st overall) over the line in 09:40. Daisy NORRIS (JW11-14) (Unattached) was third (32nd overall) over the line in 09:46 - was first to finish once before. Beck HARDING-HILL (JM11-14) was graded 77.18% for the time 07:03 (third overall). Jack BANNISTER (JM11-14) was graded 76.73% for the time 06:55 (first overall). Aidan OSCROFT (JM11-14) was graded 76.45% for the time 07:07 (4th overall). This week there were 108 runners, of whom 20 were first timers and 39 recorded new Personal Bests. Representatives of 3 different athletics clubs took part. Windmill Hill Juniors parkrun started on 8th November 2015, and since then 463 different runners, including participants from 7 athletics clubs, have completed 2,146 runs covering a total distance of 4,292 km, and there have been 500 new Personal Bests. A rather damp start this morning did not deter 90 budding athletes from taking part today. Our new run mascots the squirrels also made an appearance but luckily the runners managed to avoid them as they ran across the finish line. Thanks again to our volunteers. If you'd like to help out, please let us know. Stefan NAWATHE (JM11-14) (Unattached) was first over the line in 07:55 - first appearance. Jacob ROE (JM11-14) of Bristol and West AC, was second over the line in 08:25 - has been first to finish on 4 previous occasions. Zachary ROE (JM10) of Bristol and West AC, was third over the line in 08:41 - has been first to finish on 2 previous occasions. Lucy HAYES (JW10) (Unattached) was first (7th overall) over the line in 09:23 - second time in 2 appearances. Evie TAYLOR (JW10) of Frampton Cotterell Harriers, was second (10th overall) over the line in 09:35. Abbie MARSHFIELD (JW11-14) (Unattached) was third (17th overall) over the line in 10:12. Oscar MBOGO (JM10) was graded 70.13% for the time 09:17 (6th overall). Jacob HILL (JM10) was graded 69.45% for the time 08:58 (5th overall). Stefan NAWATHE (JM11-14) was graded 68.73% for the time 07:55 (first overall). This week there were 91 runners, of whom 15 were first timers and 14 recorded new Personal Bests. Representatives of 4 different athletics clubs took part. Windmill Hill Juniors parkrun started on 8th November 2015, and since then 431 different runners, including participants from 6 athletics clubs, have completed 1,946 runs covering a total distance of 3,892 km, and there have been 433 new Personal Bests. The male record is held by Jack BANNISTER who ran in a time of 00:07:20 on 2015-11-15 (event number 2). The Age Grade course record is held by Imogen PUGHE who recorded a 75.17% run (08:13) on 3rd April 2016 (event number 21). There was a fantastic bank holiday turn out at today's run with 101 junior parkrunners and over 40 adults joining in too. We trialled a new set-up at the start with the super fast runners starting just a little ahead of the main pack and that seemed to work well to keep everyone safe and free from collisions. Thanks for everyone for listening so carefully to the new instructions and following them brilliantly. Two wristbands were handed out this week - to Ronnie Wilmott for 21 runs (a marathon) and Beth Greatorex for 11 runs (a half marathon). Well done to both of you! Huge congratulations also go to the 26 individuals who recorded a personal best time this week. Unfortunately we think we suffered a token-related gremlin around numbers 80-85, so we're really sorry to anyone who finished around that point and who's finishing position may be showing in the wrong order. We know you love to see your results and we try really hard to get them right, but we hope you had a great run in any event. We'll see you all again next week for our six month anniversary, and don't forget your barcode! Zachary ROE (JM10) of Bristol and West AC, was first (second overall) over the line in 08:45 - second time in 12 appearances. Jacob HILL (JM10) (Unattached) was second (third overall) over the line in 08:49. Ronnie WILMOTT (JM10) (Unattached) was third (4th overall) over the line in 08:51. Catherine BROOKE (JW11-14) of Bristol and West AC, was first (first overall) over the line in 08:33 - 4th time in 5 appearances. Isabella BUNN (JW10) (Unattached) was second (10th overall) over the line in 10:12 - has been first to finish on 2 previous occasions. Rachel TILEY (JW10) (Unattached) was third (14th overall) over the line in 10:42. Jacob HILL (JM10) was graded 70.64% for the time 08:49 (third overall). Ronnie WILMOTT (JM10) was graded 70.37% for the time 08:51 (4th overall). Catherine BROOKE (JW11-14) was graded 67.64% for the time 08:33 (first overall). This week there were 101 runners, of whom 24 were first timers and 26 recorded new Personal Bests. Representatives of 2 different athletics clubs took part. Windmill Hill Juniors parkrun started on 8th November 2015, and since then 346 different runners, including participants from 5 athletics clubs, have completed 1,382 runs covering a total distance of 2,764 km, and there have been 297 new Personal Bests. Lovely to see so many runners raring to go on a beautiful sunny Sunday morning, especially the 38 new timers - great to have you along. Well done to Hillcrest for winning the much anticipated inter-school friendly. Full results are on our Facebook page (search for Windmill Hill Junior parkrun). Zachary ROE (JM10) of Bristol and West AC, was first over the line in 08:41 - first time in 11 appearances. Jude HARRIS (JM11-14) (Unattached) was second over the line in 08:46. Ronnie WILMOTT (JM10) (Unattached) was third over the line in 08:52. Lauren CHAPMAN (JW10) (Unattached) was first (17th overall) over the line in 10:00 - 13th time in 19 appearances. Jess CHAPMAN (JW10) (Unattached) was second (18th overall) over the line in 10:06. Daisy NORRIS (JW11-14) (Unattached) was third (19th overall) over the line in 10:08 - was first to finish once before. Ronnie WILMOTT (JM10) was graded 70.24% for the time 08:52 (third overall). Jess CHAPMAN (JW10) was graded 67.27% for the time 10:06 (18th overall). Remi ROGERS (JM10) was graded 67.23% for the time 09:41 (10th overall). This week there were 128 runners, of whom 38 were first timers and 27 recorded new Personal Bests. Representatives of 2 different athletics clubs took part. Windmill Hill Juniors parkrun started on 8th November 2015, and since then 322 different runners, including participants from 5 athletics clubs, have completed 1,281 runs covering a total distance of 2,562 km, and there have been 271 new Personal Bests. The sun always shines on Windmill Hill junior parkrun* and today was a fine example of that! From the moment the first "Caution Runners" sign was put up, until the last volunteer put away their hi-viz, we were all bathed in beautiful Bristol sunshine. On a day like today there really is no better place to be at 9 am on a Sunday morning than stunning Victoria Park. 65 fantastic runners, 22 invaluable volunteers and countless accompanying adults joined us and we all enjoyed a brilliant run. A summary of the main statistics is set out below, but a special mention goes to the 12 runners who were first timers and the 9 who recorded new Personal Bests. There are also several marathon or half marathon milestones that have been reached by regular runners, so there will be a few wristbands to be handed out next week. Thank you all for coming and we'll see you again next week! * This statement cannot be backed up by meteorological records. Otto Felix KINGSTON (JM11-14) of Bristol and West AC, was first over the line in 08:04 - second time in 5 appearances. Isaac HARRIS-COOK (JM11-14) (Unattached) was second over the line in 08:43 - has been first to finish on 3 previous occasions. Jude HARRIS (JM11-14) (Unattached) was third over the line in 08:48. Lauren CHAPMAN (JW10) (Unattached) was first (8th overall) over the line in 09:43 - 12th time in 17 appearances. Isabella BUNN (JW10) (Unattached) was second (14th overall) over the line in 09:58 - was first to finish once before. Jess CHAPMAN (JW10) (Unattached) was third (19th overall) over the line in 10:36. Otto Felix KINGSTON (JM11-14) was graded 67.45% for the time 08:04 (first overall). Isabella BUNN (JW10) was graded 65.80% for the time 09:58 (14th overall). Lauren CHAPMAN (JW10) was graded 65.39% for the time 09:43 (8th overall). This week there were 65 runners, of whom 12 were first timers and 9 recorded new Personal Bests. Representatives of 2 different athletics clubs took part. Windmill Hill Juniors parkrun started on 8th November 2015, and since then 268 different runners, including participants from 5 athletics clubs, have completed 1,049 runs covering a total distance of 2,098 km, and there have been 208 new Personal Bests. A fantastic 65 young people ran the 15th Windmill Hill junior parkrun on Sunday, 21 February, including 16 brand-new shiny first-timers. This takes our total number of unique runners to over 200 and means a new attendance record is surely just around the corner... Welcome to everyone who ran here for the first time this week - we hope to see you again soon! We also celebrated the brilliant achievements of Will Chapman, Thomas Budden and Avinash Price, who each received their Half Marathon wristbands for completing a total of 11 junior parkruns. Well done guys! Joseph HULL (JM10) of Bristol and West AC, was first (second overall) over the line in 08:24 - second time in 3 appearances. Will CHAPMAN (JM11-14) (Unattached) was second (third overall) over the line in 08:39 - has been first to finish on 5 previous occasions. Jacob ROE (JM11-14) of Bristol and West AC, was third (4th overall) over the line in 08:45 - was first to finish once before. Harriet LAMBE (JW11-14) of Frampton Cotterell Harriers, was first (first overall) over the line in 07:36 - first appearance. Catherine BROOKE (JW11-14) of Bristol and West AC, was second (6th overall) over the line in 09:06 - has been first to finish on 2 previous occasions. Lauren CHAPMAN (JW10) (Unattached) was third (11th overall) over the line in 10:04 - has been first to finish on 9 previous occasions. Harriet LAMBE (JW11-14) was graded 74.85% for the time 07:36 (first overall). Joseph HULL (JM10) was graded 68.77% for the time 08:24 (second overall). George BRIDGES (JM10) was graded 66.02% for the time 08:45 (5th overall). This week there were 65 runners, of whom 16 were first timers and 7 recorded new Personal Bests. Representatives of 3 different athletics clubs took part. Windmill Hill Juniors parkrun started on 8th November 2015, and since then 203 different runners, including participants from 4 athletics clubs, have completed 653 runs covering a total distance of 1,306 km, and there have been 121 new Personal Bests. The Age Grade course record is held by Harriet LAMBE who recorded a 74.85% run (07:36) on 21st February 2016 (event number 15).